(Front Row, Left to Right) Manager Marky McGrath, Dominic Cross, Sawyer Arbogast, Johnny Nedwick, Giovanni Mastromatteo, Lucas Cross, Jimmy Neme, Anthony Felix. (Back Row, Left to Right) Assistant Coach Marc Lasceski, Assistant Coach Bill Beggs, Joey Thibodeau, Michael McGrath, Jack Lasceski, Nathan Beggs, Head Coach Brian Plante, Bennett Smolek and Assistant Coach Jeff Smolek. 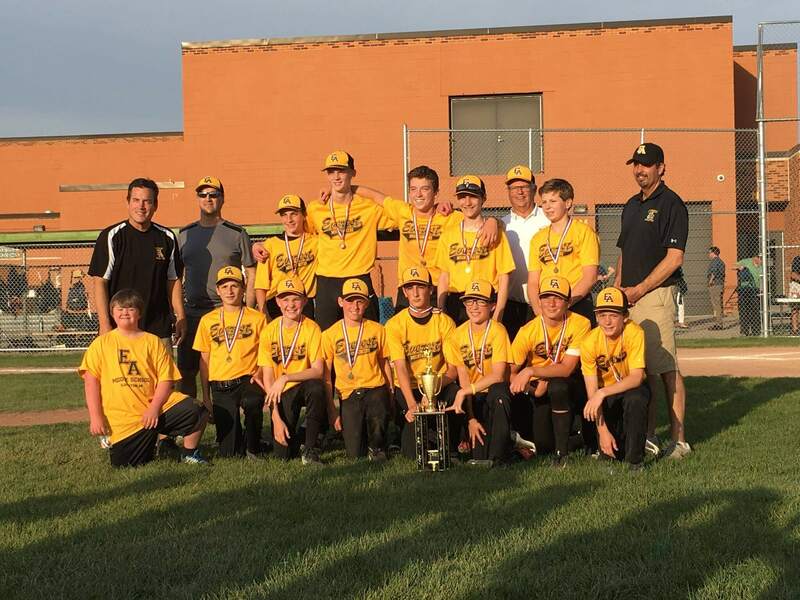 Congratulations to Coach Brian Plante and members of the EA Boys’ Baseball Black Team (Seventh and Eight Grade) who last night defeated U of D Jesuit Academy 5-1 in the championship game of the CYO Tournament!